I’ve spent a busy few weeks here—four days on the Koç campus with my friend Marnie, then ten in Kadiköy in my friend Leah’s apartment. Most of the time I’ve worked on our book of walking tours around the Grand Bazaar. It’s been grueling, fascinating, and fun. What adventures I’ve had! The next test was walk two, which Edda and I did by ourselves a few days later. We added meticulous details to our directions, carefully checking street names and building locations. We also did some interviews for feature articles. Edda helped me shop in the Cebeci Han for a belly-dancing costume for my sister-in-law, too. WOW—the shopowner kept pulling outfit after outfit from some mysterious source; the selections were incredible. Women shopowners are extremely rare in Turkey, so I was pleased to buy from a woman. That was a successful day for us—second test: B+ (a few wrinkles in building locations). We spent the next day working in Edda’s charming (albeit treasure-cluttered) penthouse apartment overlooking the Golden Horn and Sultanahmet. It was supposed to rain that day, hence the choice to review photos and clarify details together, our laptops side by side on her kitchen table. I had no idea that she’d lay out a lavish lunch for me: mushroom soup (tantalizing), shredded vegetable salad (scrumptious), olives, pickled beets, and fresh bread. YUM! Once I was completely full, she pulled out the main dish: a big bowl of rice topped with a delicious vegetable and sausage goulash (from her Austrian roots). Full as I was, I managed to devour every bite. When she pushed me to seconds, though, there was no hope. I was STUFFED! That was my Thanksgiving dinner. And I am truly thankful for all that I have. The next day (forecast cloudy with little chance of rain) we met at the Çemberitaş monument near the Grand Bazaar, umbrellas in hand. I’d forgotten my camera, but it was no great loss, as it rained all day. At one point we were climbing a steep cobblestone street in a downpour. The tile gutter running down the center was a torrent, and water poured over our feet. Nothing to do but continue, which we did. Yet another Istanbul adventure. Our last day of trekking together was a long one, and the highlight was a rooftop that I had discovered on my own. 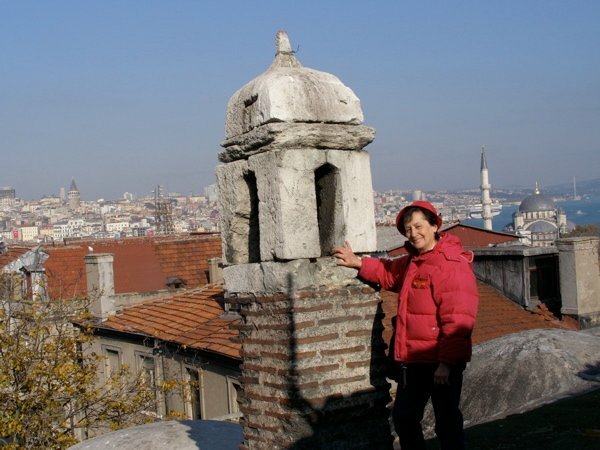 The Sair Han (the Büyük Valide Han’s third courtyard) has an outdoor stone stairway leading up to a rooftop with an amazing view overlooking the Golden Horn and the Marmara (and lots of stray dogs). We were snapping pictures when a friendly young man carrying a white chicken appeared and began chatting with us. He offered to show us the view from the highest point, and of course we accepted. He led us around the corner of the Tower of Eirene, a crumbling edifice on the corner of the rooftop, and we clambered up two more rooftop levels to the pinnacle—what fun! (Let me remind you that my friend Edda is 70 years old—a youthful and sprightly woman always game for adventure.) At the top we discovered two tiny workshops, one for dying lace, and the other for making tea. Unbelievable. Luckily, our young guide (a tea shop owner from the main floor of the han) led us down through a maze of crumbling stairways to his shop, where he invited us to return later. Unfortunately, we didn’t. Too busy! Another highlight that day was an interview with a street cobbler, a man who sets up shop every day on a corner beneath a tree. 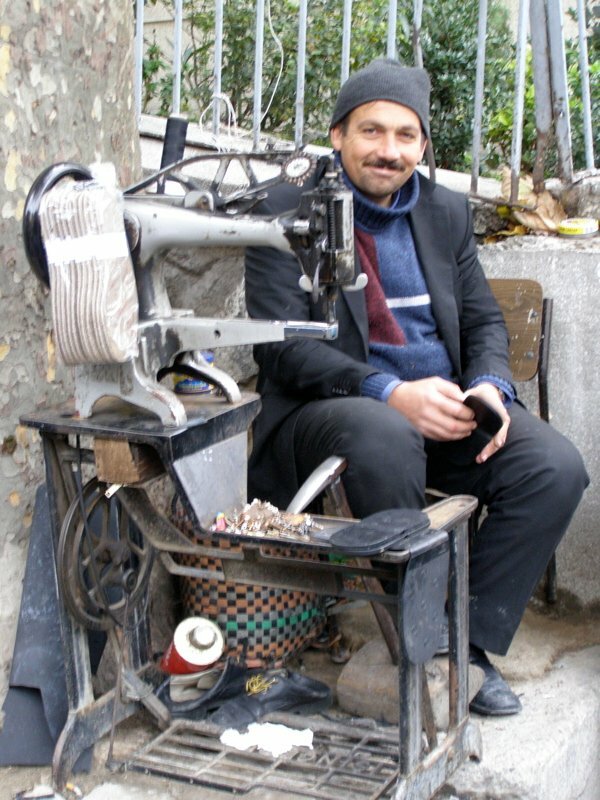 Year round, he brings his table, an old sewing machine, and his last (a cobbler’s tool). When it rains, he adds an umbrella, and when its cold, a small grill. What a guy! It’s been a fun, rewarding, and exhausting week. 2000 photos and 40,000 words behind me, I’m hankering for a LONG nap on the plane. By the way, yesterday we delivered our book to Çitlembik Publishers—all except the maps. I have to make some corrections on those. It’s been an exciting project, and I know the work is far from over, but we’re on schedule. HOORAY!!!!! When I was first invited to join one of Edda’s hans walking tours, I had no clue what a han was. Did I care? A walking tour in Sultahahmet was temptation enough. Little did I know on that first fascinating walk that I would soon be collaborating with Edda Weissenbacher on a book of her walking tours. But I digress. A han, in case you are as uninformed as I was, is an ancient inn, a stop along the camel trading routes. Caravans of merchants stayed there for a few nights, weeks, or even longer to trade their wares in the city. It usually had two levels of rooms around a porticoed courtyard. The upper level rooms were reserved for sleeping and living, while the lower level offered storage rooms for merchandise, usually a kitchen, and sometimes stables for the caravans’ camels and horses. The courtyard’s fountain and perhaps a small mosque served the residents of the han. Hans were like small, bustling castle keeps, their massive gates locked securely at night against burglars. Cuhacı Han with Nur-u Osmaniye Mosque behind it. 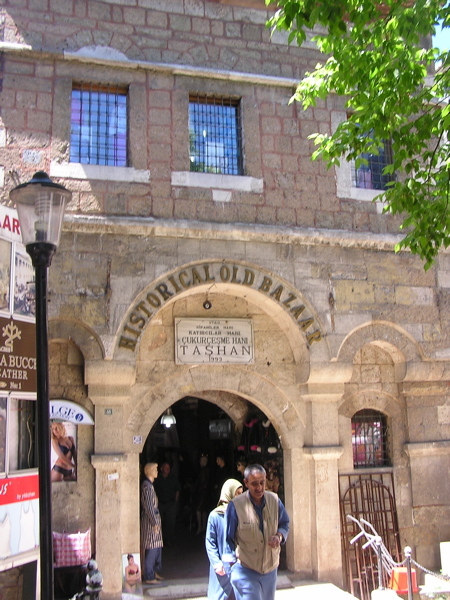 Not surprisingly, many hans were located near the Grand Bazaar (Covered Market) area where merchants traded their wares. Built between the years 500 and 1900, scores of ancient hans still stand, though most have been remodeled and many are unfortunately dilapidated. 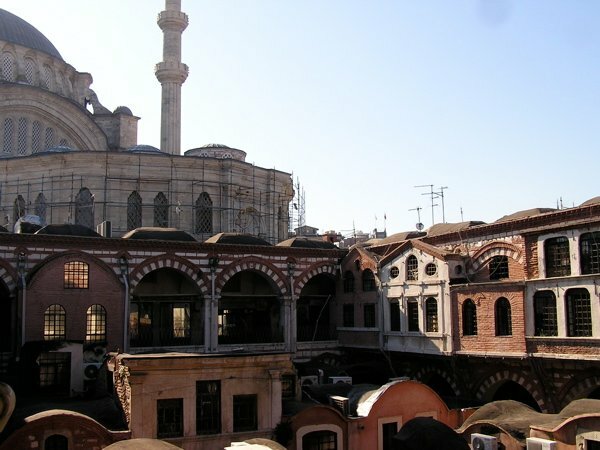 A few of the more notable ones are the Vezir Han (next to the Çemberlitaş Hamam), the Büyük Valide Han (on Mercan Caddesi behind the Grand Bazaar), and the Taş Han, west of the bazaar near the Laleli Mosque. 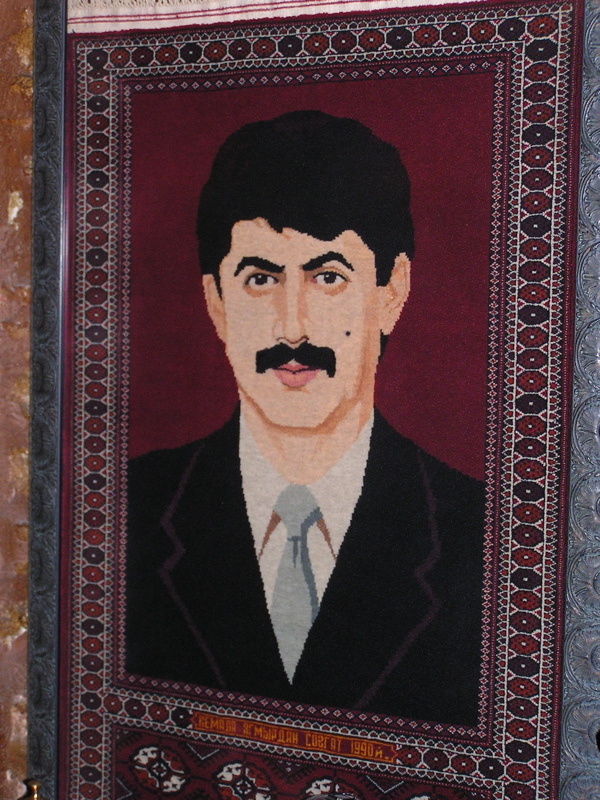 There are also a number of very charming hans located within the bazaar, offering an oasis of peace and sunshine—a welcome break from the hectic bustle of the Grand Bazaar. The Taş Han, one of my favorite hans, was recently refurbished with close attention to historical accuracy. Sultan Mustafa III had it built in 1763 as a part of the Laleli Mosque complex, originally intending it as an inn for his guests. According to tradition, visitors to the hans were accorded free meals and lodging for three days, then they were expected to move on (sort of like the guests and the “old fish” proverb). The han was then known as the Sipahi Han, since “spahee” means a place for donkeys; the han’s underground cistern was converted to a stable. 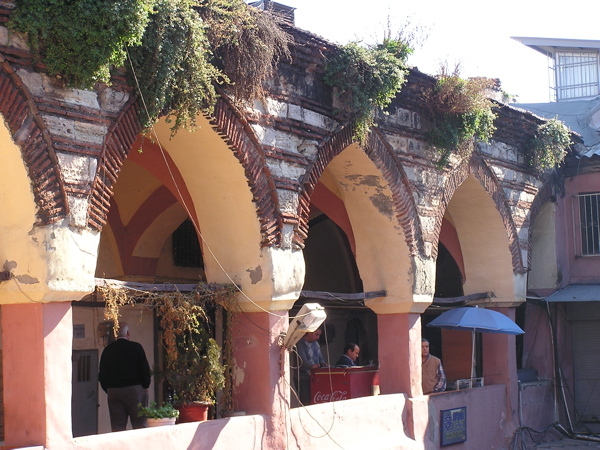 Later the han was used as a Janissary station (for the sultan’s soldiers), an inn, and eventually a bazaar. It went through a number of name changes, finally ending up with the very unassuming name Taş Han (stone building). Over the years the han fell into disrepair, but it was purchased in 1987 by Kemal Ocak, a Turkish leather merchant with a vision for the han’s future. It took years to secure permission to restore the han, and Ocak was eager to set things in motion. The restoration was grueling, completed by a team of 30-40 experienced restoration specialists working day and night. Ocak paid close attention to detail, and his project was endorsed (though not funded) by the Ministry of Antiquities, which required mountains of paperwork as well as careful attention to historical restoration. Completed in 1993, the results of Ocak’s efforts are impressive. 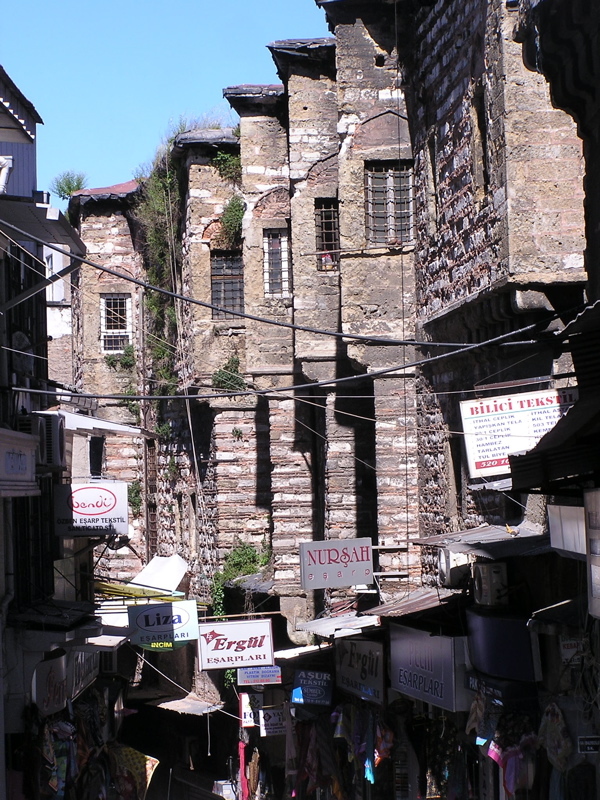 A visit to the charming Taş Han transports us back hundreds of years. Its modest arched entrance and stone corridors lead to an open courtyard topped with as many chimneys as the original structure would have had—one for each upstairs sleeping cell. The former storerooms that ring the courtyard are now shops offering clothing, leather, and fur. The courtyard is graced by a fountain, near which groups of men sit around tables shaking backgammon dice, sipping tea, and smoking water pipes (nargile). A stairway at the far end leads down to what was once a Byzantine cistern. It is now the Arkat, a night club restaurant that features nightly floor shows of Turkish music, magic, and of course, bellydancing. After the show diners dance into the wee hours. That probably didn’t happen in the early days of the han, but who knows? Across the courtyard is a passage to a second courtyard with another fountain in the charming Tas Han Restaurant as wel as another entrance to the han.For more information, watch for our new book, Edda’s Istanbul—Back-street walking tours around the Grand Bazaar by Edda Renker Weissenbacher and Ann Marie Mershon. It should be out next summer.